This Australian oilskin duster drover coat is great for both women and men, featuring a flannel lining, waterproof materials, high quality snap closures, and a popular black color for only $119.99 for a limited time only! $199.99 Sale $119.99 For A Limited Time! 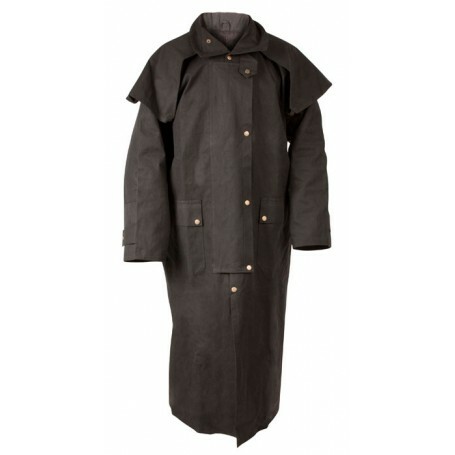 Our Australian Oilskin Duster Coats are suitable for riding or general all purpose use. Made with 100% cotton specially infused twice with our oil/wax formula to ensure rain, wind, and snow protection. The wide gusset will cover your saddle or motorcycle. A solid color flannel liner on the full length coat stops at the waist for extra comfort and prevents bunching under your seat. Liner is NOT removable.